Tara Gategood, host of Native America Calling will speak to Albuquerque Press Women on Monday, February 12 at 12:30 p.m. The meeting is held at the Golden Corral. (5207 San Mateo NE). She will be discussing her call in show on KUNM and the concerns her listeners have and how well they track with information available in the main stream media. In 2005,Tara joined the Native airwaves with the now 22 year old nationally syndicated call-in radio show Native America Calling. 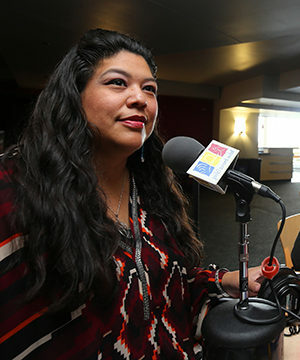 Each weekday she leads thought-provoking conversations with invited guests and callers on issues specific to Native American and Alaska Native communities and the people they connect to. For more than 20 years she has worked in Indian Country in the arenas of art, music, health and community development. She has morethan 19 years of experience as a journalist. Beyond radio broadcasting, her palette of story sharing also includes working in Washington, D.C., South Dakota, Minnesota, Massachusetts and New Mexico. She reported and photographed for several news organizations and her past works can be found in the Boston Globe, Aberdeen American News, St. Paul Pioneer Press, Transmission Magazine, Albuquerque The Magazine and Native Peoples Magazine. She is a member of the Native American Journalists Association (NAJA) and is a former board of directors member of UNITY: Journalists for Diversity. She is the recipient of several NAJA awards for her work in print and broadcast journalism. She was also named one of the National Center for American Enterprise Development (NCAIED) 2015 “Native American 40 Under 40” Award winners. She is also the voice of the Indigenous Foundation music programheard on Santa Fe New Mexico’s KSFR 101.1 FM each Saturday. 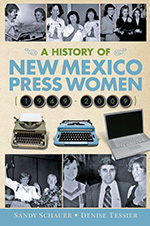 Everyone is welcome at Albuquerque Press Women events. Individuals are responsible for their own meals. No reservations are required. Non-members will be charged an additional $5.